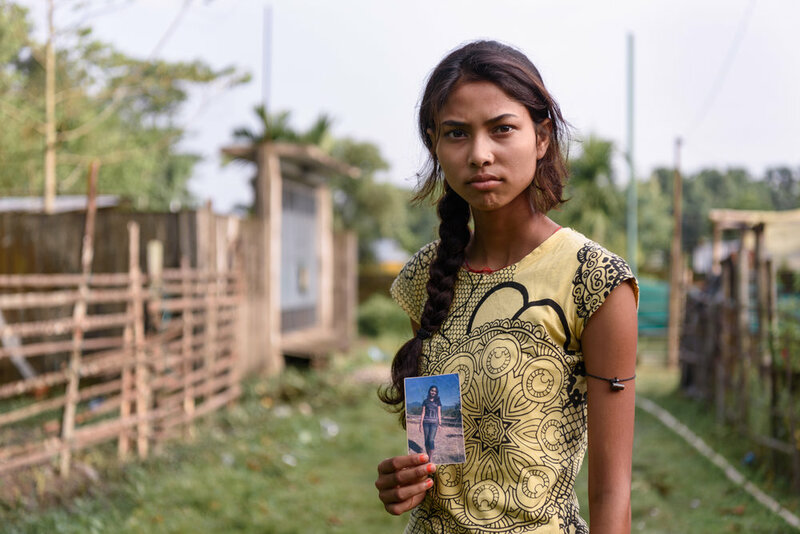 Binita Biswakarma, 15, with a photograph of her sister Ranjana. Ranjana, 16, has been missing since 2009. She was trafficked by her uncle while travelling with him for a family wedding. Binita's parents are illiterate and never filed a police report until two years ago, following Binita's continued persuasion. 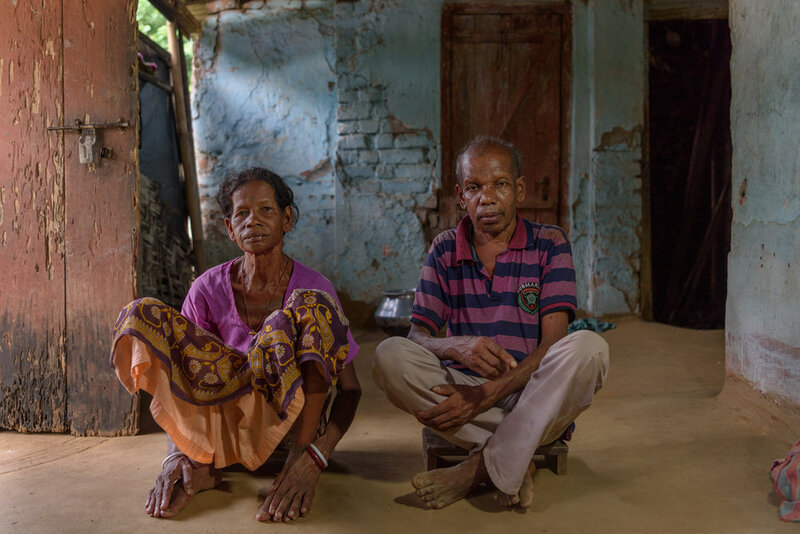 Sanchariya Oraon, 42, and Fhago Oraon, 45 at their home in Matelli. The couple's daughter Asha, 16, has been missing since six years. An acquaintance took Asha to the neighbouring state of Sikkim to work as a maid at a tourist lodge. Asha never returned home and there is no information about her whereabouts. Outside the abandoned female maternity ward of the Manabarriete hospital. The Manabarriete tea estate was shut down a few years ago leaving hundreds of families jobless and in extreme poverty. Many girls from around the tea estate are currently missing. Purnima Naik, 40, was trafficked in July 2015 and was first taken to Siliguri and then to Delhi and sold for $300. After working in Delhi for a few months as a domestic maid, she was taken to Ranchi. She was rescued by the police in October 2016. Sunita Biswakarma, 40, shows the photograph of her daughter Ranjana. Ranjana, 16, has been missing since 2009. She was trafficked by her uncle while travelling with him for a family wedding. Except for a birth certificate and a photograph, there is no other evidence of her existence. S., 18, was first trafficked by her aunt when she was 11 and sold her to a placement agency. The agency sold her for domestic work where she was regularly beaten and sexually abused. S. ran away and got help from police and returned home. At 15, S. was trafficked again and sold to another agency. She managed to excape again after 6 months. School certificate of Sugi Lohar, 15, who has been missing from the Toonbari Tea Estate since 2007. The certificate was issued earlier this year after Sugi's father requested the school since he required a proof to file a police report. The report was filed in 2017, ten years after her disappearance. 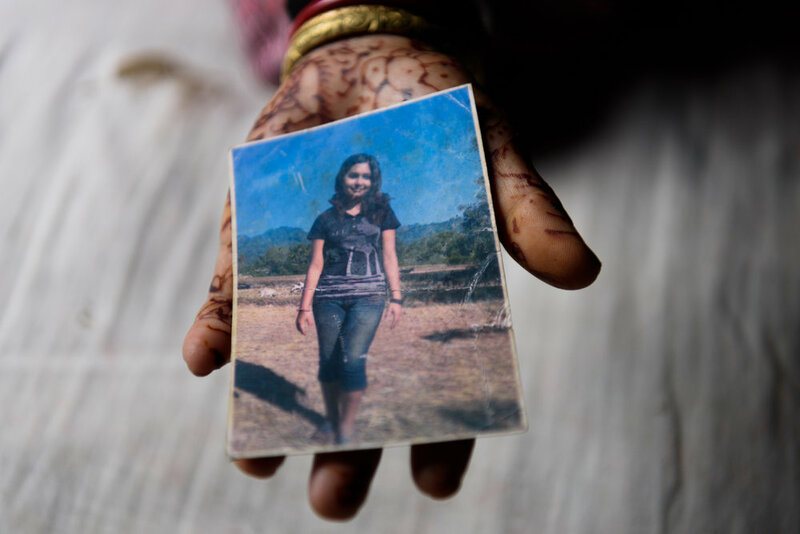 Renuka, 10, was an infant when her sister Ranjana went missing in 2009. Ranjana was trafficked by her uncle while she was travelling with him for a family wedding near Chalsa Tea Garden Estate, West Bengal. Though Renuka has no recollection of her elder sister , she clings on to the hope that she would meet her one day. The house of Champa Soren, 35, who was trafficked in 2014 from the Chengmari Tea Garden. Champa used to be severely beaten by her abusive husband. To escape that, Champa fell into the hands of a trafficker who promised her a job and took her to Delhi and sold her for $300. Champa was rescued from Sonipat in July 2017. Gulzaha Khatoon, 41, works at a tea garden since 2007. 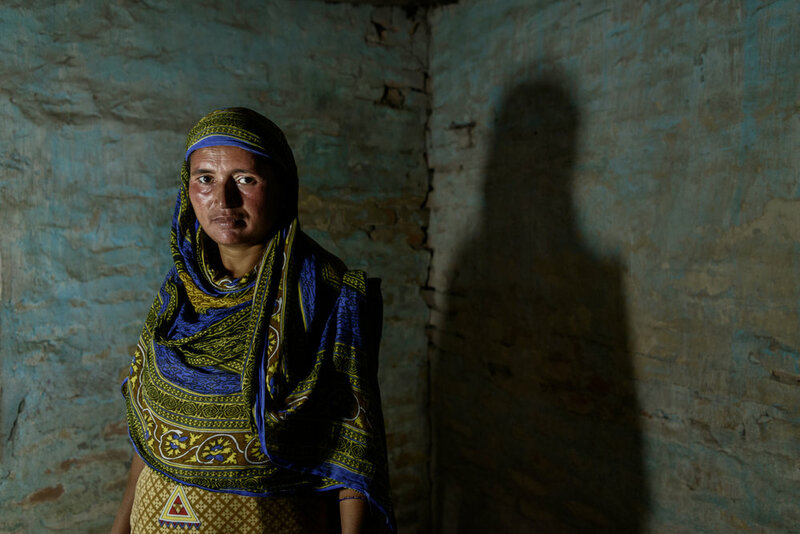 Her step-daughter was trafficked by a neighbour and sold for $700 in 2009 in Delhi. Gulzaha beat the neighbour into confession and went to Delhi and rescued her daughter after nine months. Currently she helps the police and works in her community to raise awareness on human trafficking. The Coronation bridge at Sevoke connects the city of Silliguri with the Dooars region. Traffickers often use this route to take the girls from the tea estates to Sikkim and other parts of India. Champa Soren, 35, with her daughters Renuka, 15, Sonika, 16 and Roshni, 10. Champa used to be severely beaten by her abusive husband. To escape that, Champa fell into the hands of a trafficker who promised her a job and took her to Delhi and sold her for $300 in 2014. Champa was rescued from a private residence in Sonipat in July 2017. A meeting between a local activist working on anti-human trafficking and police officers at the Banarhat Police Station, West Bengal, India. Police record files hang on the walls of Banarhar Police station, West Bengal, India. This region is notorious for trafficking and many girls have been missing from the area. Sanchariya Oraon, 42, holds a toy belonging to her daughter Asha. Asha, 16, has been missing since six years. An acquaintance took Asha to the neighbouring state of Sikkim, India to work as a maid at a tourist lodge. Asha never returned home and there is no information about her whereabouts. Dinesh , 12, at his home near Binnaguri in West Bengal. Dinesh's mother Pratima has been missing since two years. The family suspects an agent of selling her to a brothel in Delhi.